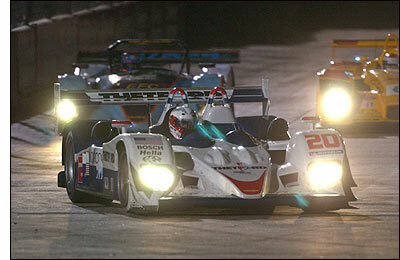 From the start, it was clear that Houston would be difficult venue for the teams of the American Le Mans Series. It was even more so for Dyson Racing. A shared-headline event would of course reduce track time, the track would be new to everyone, and a temporary course has its own problems. This time it was bumps. Not bumps like Sebring, or even Lime Rock bumps, but B-U-M-P-S. The two-day race weekend opened with a fifty-minute practice for the twenty entrants on Thursday morning. At 11:10 AM It was not a particularly hot weekend, in contrast to races in Texas in other years. The air temperature was 81 degrees and the track 92 degrees F.
Thursday morning on a new street course went as well as might be expected. There were no cautions in the session, much to the credit of the teams and drivers of the American Le Mans Series. For those who did have problems, they were not of the damaging kind, and not of the kind that interrupted the session for anyone else. Unfortunately, Dyson Racing was amongst them. Chris Dyson got in a scant seven laps, before being sidelined for the remainder of the practice with a power steering failure. The #20 Dyson Racing Lola B06/10 was just about ready to return to the track when the checkered flag ended the session, so we expected to see Chris and co-driver Guy Smith in a now much-needed second practice immediately before qualifying. According to Audi Sport North America driver Rinaldo Capello, who took the team’s R8 on the track after partner Allan McNish, “In one word, bumpy. At the moment this course may be too aggressive for sports cars. The last bump at the end of the back straight (corner 9) is very dangerous, and for the Champ Cars it will be even more (so). Right now the GT cars can go through it faster than us because their cars can be more aggressive. Allan (McNish) warned me about the bump, but that’s not the same as driving through it.” Nonetheless, the Audi headed the times in the first session. Once again, the venerable R8 surprises. Or perhaps that’s wrong; we should never be surprised by the performance of that very special sports car. Heading the LMP2 times was the #6 Penske Porsche prototype of Sascha Maassen and Lucas Luhr, posting a 1:08.053, second overall behind the Audi. The Penske guys aren’t all that happy with the circuit, either. We’re told that the rounded-stone aggregate used in this giant parking lot is particularly slippery; the RS Spyders are struggling for grip. 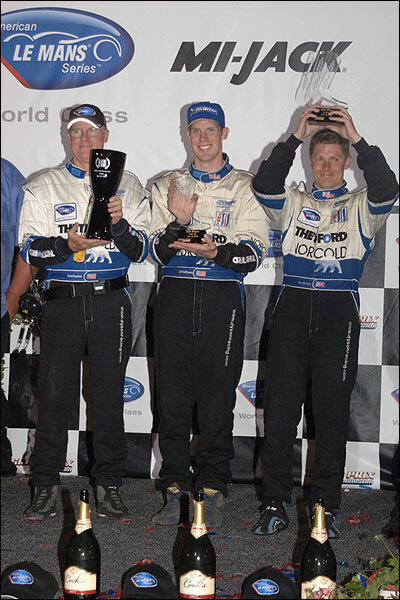 James Weaver and Butch Leitzinger were third overall and second in class behind the Audi. It was a solid start to only the second race weekend for the Lola B06/01 AER. James was philosophical about the course. “A bump is just a vertical corner, isn’t it?” suggested the Englishman. “That’s why you’ve got an engineer in the pits armed with a hammer to fix it, after all. At the end of the day, they’re all equipped with a throttle, aren’t they? And you can alter your line. If someone can set up the car to hold it (the speed) a bit longer (over the bumps) they’ll have won fair and square, won’t they? What I’m really worried about is the long turn (around the Astrodome). It’s blind, and 135, 145 miles per hour, isn’t it? If some Wally stops on the apex, you could do yourself – and him – serious injury.” James and Butch Leitzinger put the #16 Lola third on the time sheets in the first session. Rob Dyson helped out with a summary of the team’s morning, “The cars are fine, and we’re happy to be here,” he observed. The second, and last, practice before qualifying started on schedule at 5:20 PM, with the temperature in the low eighties. As with the other teams – most of them anyway – the crew of the number 20 Dyson Lola B06/10 AER was “softening” the suspension to accommodate the bumpy track. The front springs were changed in the pits midway through the session. Again, after limited practice, the session ended with the #20 Lola sidelined – it wouldn’t fire. The analysis and fix would take the car out of the remainder of the practice and the subsequent qualifying session. Just before the end of the session, James Weaver posted the fast time for LMP1 cars, just a tenth behind Romain Dumas’ Porsche RS Spyder’s session-leading time of 1:05.111. The twenty-minute qualifying session got underway at 6:50 PM, and Dyson Racing was ready, though there was only the #16 Lola of James Weaver to carry the team’s colors; Chris Dyson would start the #20 car from the back of the grid. The first five minutes or so of the session saw the two Porsches and the lone Audi at the top of the times. Weaver was getting a feel for the line though, and at 6:56 pm, set the fastest lap overall with a 1:04.469, quickly following it with a tick better, 1:04.459. Three minutes later, Romain Dumas posted a slightly quicker 1:4.454, but it was a time “helped” by a couple of tenths by cutting the chicane, and was quickly disallowed by IMSA officials. Weaver was complimentary of the course, bumps and all. “This is a typical street course; it’s bumpy, yes, all street courses are. They’ve done a great job. If you want me to find something wrong with it, I’ll say that the chicane is too blind, they could have done better there. For the bumps, that’s why you have engineers with spanners, to make those adjustments (to set up for a track),” said James. “The long sweeper at turn four (that’s the increasing radius turn around the Astrodome), the car can take it flat easily, but if you do make a mistake, you’ll hit the wall. Friday’s early afternoon thirty-minute warm-up session on race day was pleasantly uneventful for the team. Butch Leitzinger’s 1:07.706 was second in class and fourth overall; Chris Dyson posted a 1:11.513 while still learning the circuit, so limited was his and Guy Smith’s track time. The first Lone Star Grand Prix got underway at eight PM, in the Texas twilight. James Weaver, on the pole, sprinted away and led the first lap, with Romain Dumas in hot pursuit, as he had been in qualifying. Among the leaders, Sascha Maassen, #6-P2 Porsche RS Spyder was into the pits just ten minutes after the start, following an off in the runoff at turn 8 in which he had flat-spotted the tires. Over that first thirteen minutes, James Weaver was able to pull slightly away from the pursuing Spyder, building about a one second cushion at times. “It might have been just adrenalin,” said Butch Leitzinger later. Sometime early in the race, the left front shock (damper) had lost pressure – 100 pounds, in fact. With Weaver’s suspension in dire straights, Romain Dumas’ Porsche RS Spyder muscled past and quickly built an overall lead – 1.887 seconds over the Audi R8 of Rinaldo Capello after 18 laps. Forty minutes into two-hour, forty-five minute race, the #2 Audi of Rinaldo Capello led LMP1, but trailed the LMP2 Porsche of Romain Dumas. James Weaver was doggedly hanging on to the third spot and on to the lead lap, while Chris Dyson had once again fought himself back to third in class. Rinaldo Capello pitted from the class lead at fifty-two minutes, the early stop in part because he was being held up by Sascha Maassen’s Porsche. McNish replaced Capello in the Audi. An hour into the Lone Star Grand Prix, Romain Dumas had the #7 Porsche RS Spyder in the lead overall by just under one lap over James Weaver, about 1 minute 7 seconds. Neither car had pitted. 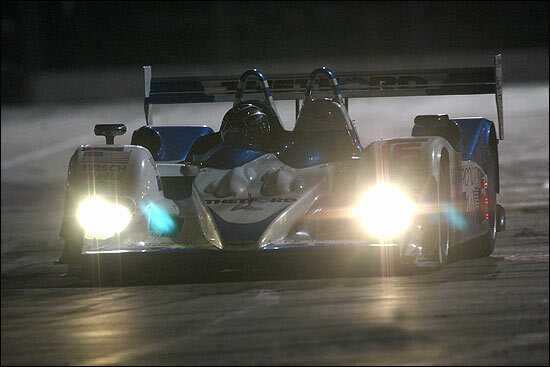 After stopping, Allan McNish’s Audi was only 5 seconds behind Weaver, but had a pit stop in hand on the Dyson driver. James pitted the Dyson Lola from the LMP1 lead at 9:08, just over an hour into the race, Butch Leitzinger took over in the cockpit. The stop was further trouble for the team, though as two minutes at rest were quickly rung up by delays with mounting tires and extra time to clear large amounts of rubber from the left side intake. The sister car would have little of that problem, and the team concluded that the shock failure, which dropped the left front corner, may have dropped it so far that the Lola was literally “hoovering” – in the words of one member of the Dyson team – rubber off the track, sucking it into the side-pod. The wheel mounting delays affected both cars. This is one of those new car things, the tolerances between the drive pins and the wheel are too tight – there is a fix. Chris Dyson pitted three minutes later, and changed over to Guy Smith. The stop was 1:51, again affected by difficulty changing tires. Soon after, Allan McNish cashed that pit stop in hand and took the overall lead from Dumas’ Porsche as the latter pitted for fuel and tires. 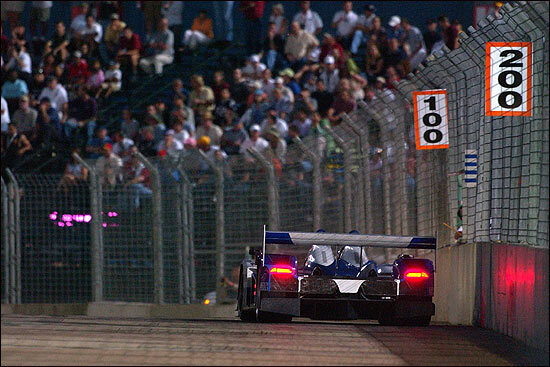 At the race’s halfway, Allan McNish (Audi) led overall by 13.9 seconds over Timo Bernhard (Porsche). Butch Lietzinger was second in class, two laps back of McNish; Guy Smith was circulating quickly by then, but two laps further down. Also at the halfway point, the air temperature was 74 degrees and the track temperature 84 degrees. That was important at the time, because shortly thereafter, when McNish pitted for fuel only and had his second stop “in hand” Porsche had only two possibilities of winning, after giving up the lead to McNish – an Audi on-track incident (McNish is as unlikely as anyone to make a mistake), or tire wear that might significantly slow the Audi. Michelin engineers confirmed that the tires would likely to be fine to the end. So a few minutes later, by the end of the race’s second forty-five minutes, after the two Porsches and the #16 Dyson Lola had made their first routine pit stops, McNish had the R8 comfortably in the lead, seventeen seconds over Timo Bernhard, who had taken over from Dumas in the Porsche. Lucas Luhr and Butch Leitzinger had taken over the duties in the #7 Porsche and the #16 Lola, and were one and two laps off the pace, respectively. 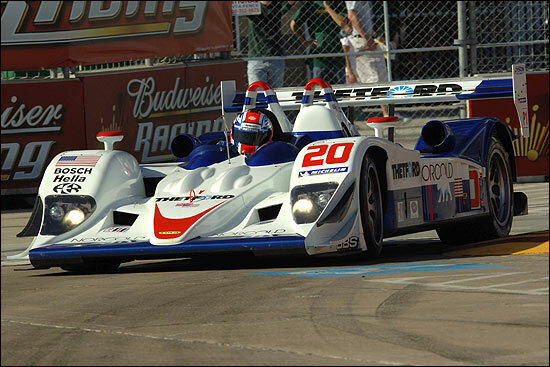 The #20 Dyson Lola, now driven by Guy Smith, was making up ground. 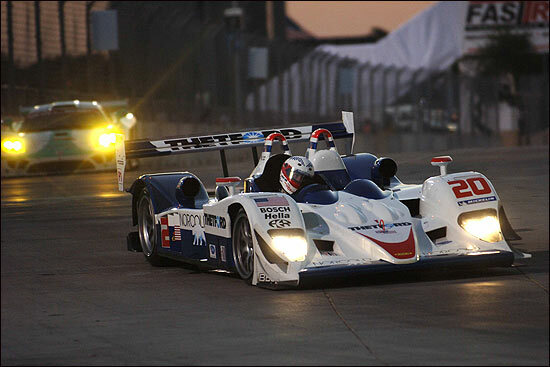 The five contending prototypes were all lapping between 1:05 and 1:09, depending on traffic on the 1.7-mile circuit. The course was bumpy; James Weaver admitted he never thought he would say a race track was bumpier than Sebring. He has now. 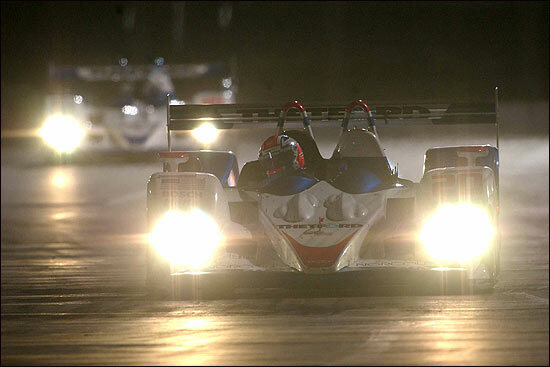 At 9:43 PM, 1 hour 38 minutes into the race, Allan McNish pitted for fuel only, and made no driver change. Timo Bernhard took the overall lead. 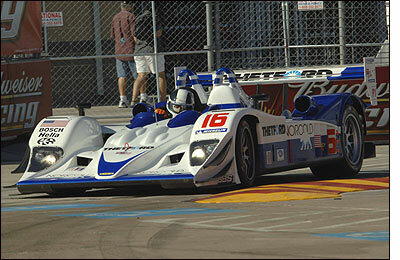 Seven minutes later, Butch Leitzinger brought the #16 Lola into the pits and took on tires and fuel. Butch was just intent on finishing with the ill-handling car. Timo Bernhard had a lead of 16 seconds on Allan McNish, not enough to cover the stop he still has to make. Audi will easily finish without stopping. Meanwhile, Romain Dumas had yielded the #7 Porsche to partner Timo Bernard. So far, the Porsches were doing fine. "It was a dream stint,” said Dumas. “The car was great to drive. After passing Weaver (early in the race) it was easy to drive around. It shows we are just one step quicker." That last was a jab at James’ qualifying press conference comment that “…first of all I learned that my car is quicker than his car! (nodding to Porsche driver)…” Both comments were with smiles. 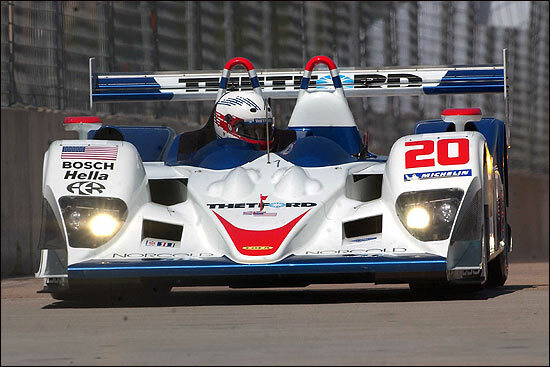 Guy Smith brought the #20 Lola into the pits just before the two-hour mark. The stop took over fifteen minutes, to replace the right push rod and rocker arm. The latter has 41 rollers in its bearing. It was amazing they got them all in – that they didn’t lose one in the process. Butch Leitzinger pitted with less than forty-five minutes left, and again the team struggled with a wheel change, the right front. Butch no longer had the use of fifth and sixth gear, the objective was simply to finish and take whatever points could be had. James Weaver helpfully explained at the time, “We’ve lost fifth and sixth gear. Well, actually, we haven’t lost them, they’re still in there. They just don’t work.” The dog ring for fifth and sixth gear had broken; the #16 car would finish the race with just the first four gears. Timo Bernhard pitted the Porsche from the lead a bit over two hours into the race. The Penske team gave up the lead to Allan McNish and Audi – that was foregone – but a battery replacement would put punctuation on it. While the two Lolas struggled home to claim second and third in the LMP1 class for Dyson Racing, the Porches encountered late race problems. One, then the other, fell by the wayside with mechanical failures and yielded the first two LMP2 podium positions to others. Dyson Racing would need a similar failure from the Audi R8 to claim the LMP1 win here. Not surprisingly, given the history of that race car, they didn’t get it. At 10:50 PM, after two-hours forty-five minutes, the checkered flag flew. Houston was “in the books” as they say. To leave without the win was disappointing for sure, but Dyson Racing’s record of twelve straight LMP1 podium finishes remained intact. 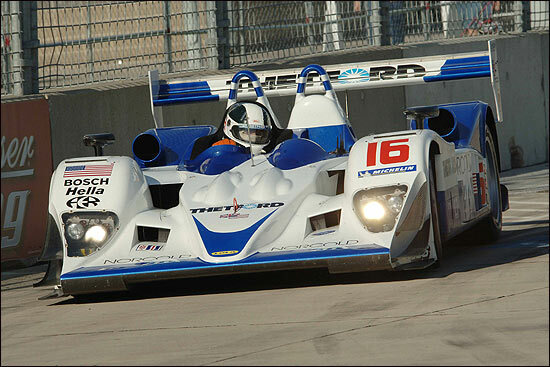 On a track that drivers termed bumpier than Sebring, the number 16 car of James Weaver and Butch Leitzinger finished second in class and sixth overall. Chris Dyson and Guy Smith brought the sister 20 car home third in class on this inaugural 1.7 mile street course, run under the lights around Reliant Stadium. Chris Dyson started the #20 car from the rear of the field after a mechanical problem prevented him from posting a qualifying time. Despite having had very few laps in fraught sessions prior to the race, Dyson picked off fifteen cars in fifteen laps and was up to fifth place. But on lap 16, he spun in the oil dropped by a retiring car in front of him and dropped to the back again. Dyson started the process all over again and set a series of quick laps before handing the car over to Guy Smith, in tenth place. The Yorkshireman was on the pace instantly and continued the 20 car’s march forward. Dyson Racing did well at Mid-Ohio last year, finishing one, two. Here’s to happy returns.